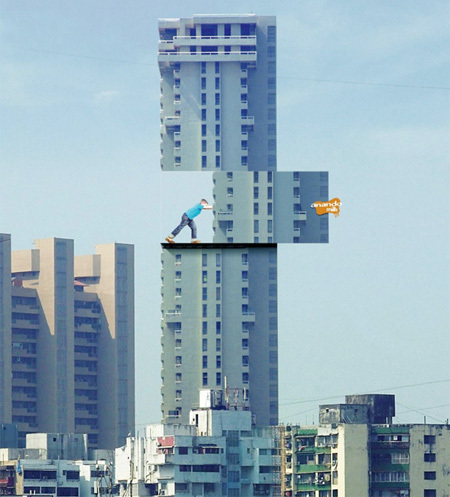 Clever uses of buildings in advertising campaigns by various companies. 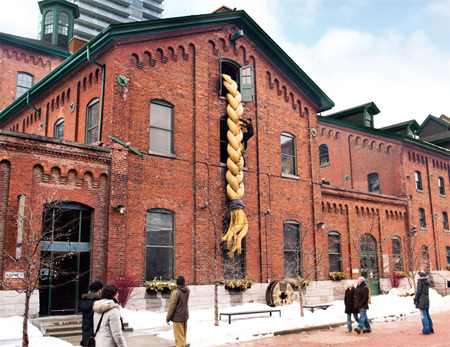 To demonstrate Pantene’s claim of “Really Strong Hair”, climbers climbed the oversized ponytails attached to a building in Toronto. 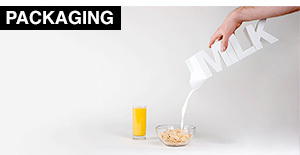 Considering that every child lives in a world of fantasy, the idea was to encourage kids to drink more milk by exaggerating the benefits of milk. 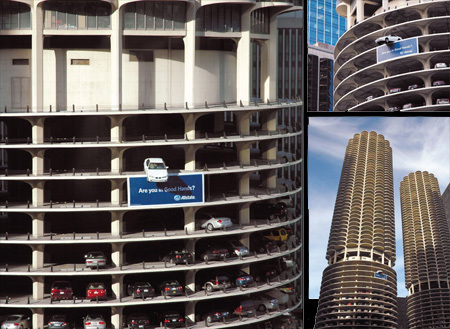 To promote Allstate auto insurance, an actual car was hanging on the edge of the parking garage in Marina Towers, a famous landmark in the center of downtown Chicago. 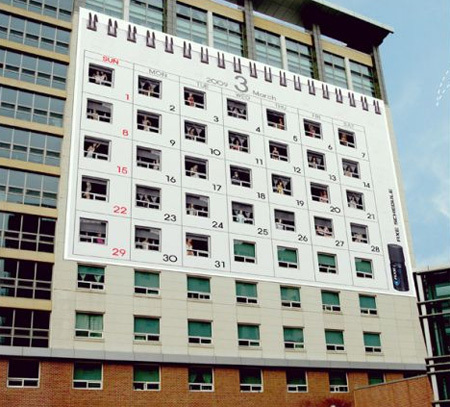 Female dormitory was decorated in the shape of a calendar to demonstrate that a new female can be met on a daily basis. 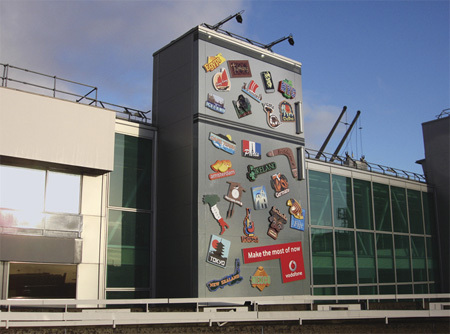 BBH London has created this cool ad outside Heathrow Terminal 1. The ad fits in with Vodafone’s strategy of “Make the most of now”. Stickers were placed on office buildings, giving the illusion of someone who has run through the wall to escape boredom. 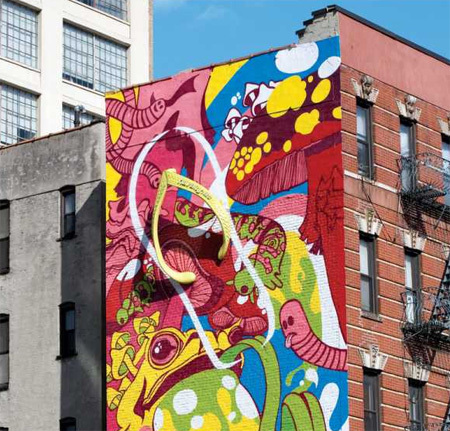 Clever building advertising promoting Havaianas sandals in New York. 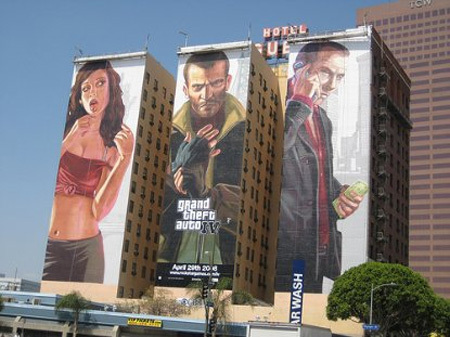 Gigantic advertisement promoting Rockstar’s Grand Theft Auto IV. 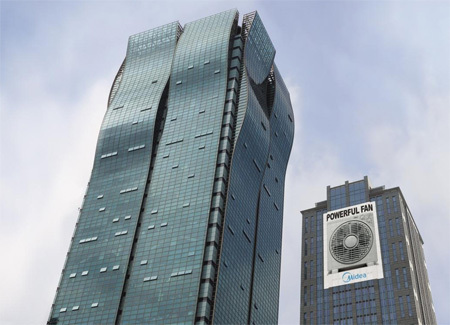 Clever advertisement was placed behind Shanghai Haitong building to promote new powerful electric fan by Midea. 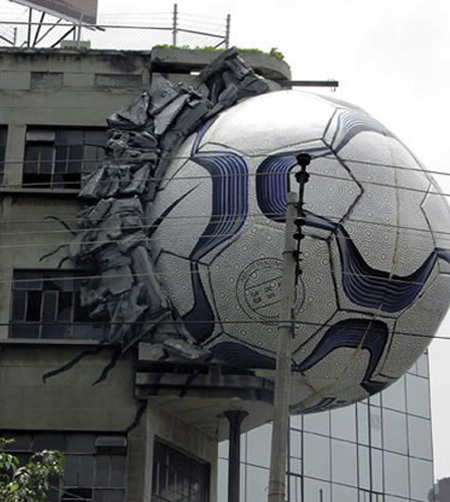 Giant ball stuck on the side of a building promotes the World Cup. 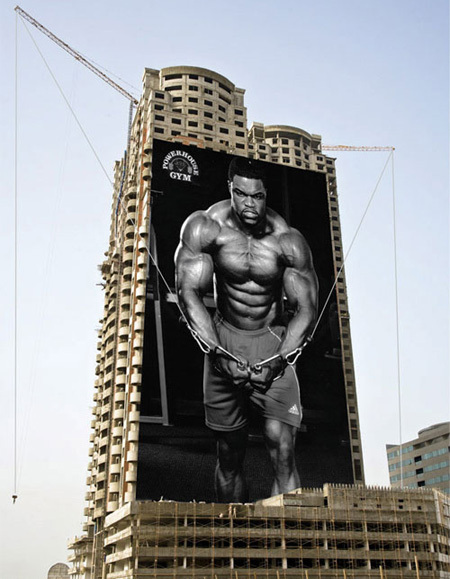 Creative advertisement campaign by Powerhouse Gym gives the impression that a body builder is lifting heavy weights from the construction site. 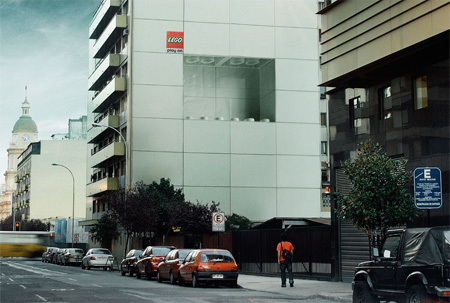 LEGO advertising in Chile made to match the panels of the building. 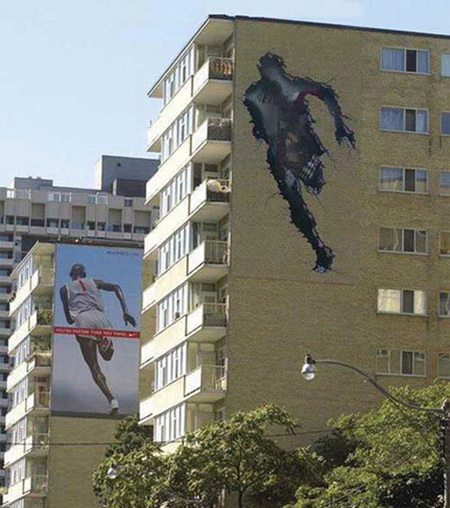 The first building has a cracked image in the shape of the running man, the second building has the actual Nike ad, creating the illusion that the runner run through the first building. 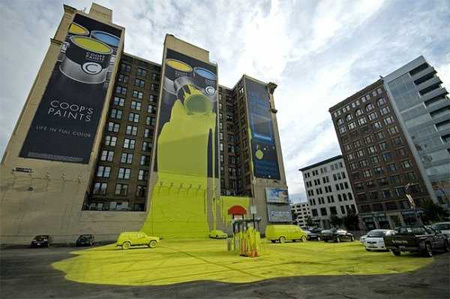 Yellow paint was dripping off the north side of the Atlas Building in downtown Columbus, Ohio promoting Coop’s paint. There are some very nice adverts there! Especially the Powerhouse Gym advertisement is awesome! Ummm, the paint one at the bottom is actually for Nationwide Insurance. sidenote: Coops paint is actually a fictional company, the Advertisement is for Nationwide Insurance. 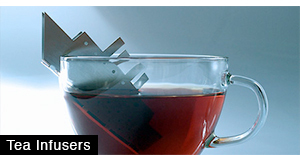 being an advertising major, i think these are F**king awesome. 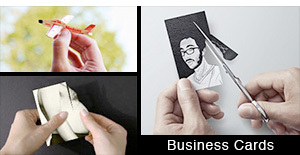 Awesome creativity, love all of them! MOST of them make you just stare at your screen and say WOW!!! 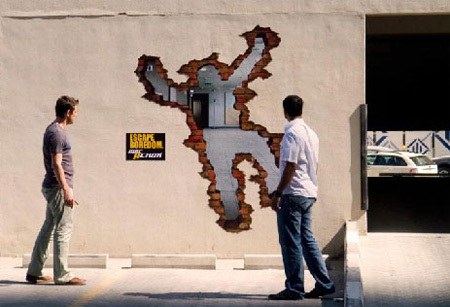 Great posting with tons of brilliant examples of real guerrilla marketing! 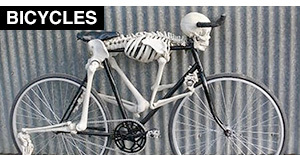 Thanks for sharing these creative outdoor advertising photos. 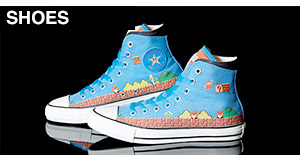 These are pretty freaking cool. You have to wonder how long it took to put some of these up. Some REALLY exciting use of building spaces for advertising, especially the building that are empty! Keep up the good work Ad Guys! Even good to stare these only in photos…how a precious brain to invent them! Advertising and Marketing students, please in the future don’t get caught up on what is “fu(k!ng awesome” versus what actually generates sales (your job). Brand awareness for a fu(k!ng awesome ad fades faster than your tan in Siberia… you need to create a product experience after this exposure. Do not forget it! A least half of these were not produced and were simply submitted as concepts. 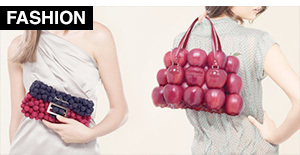 It would be nice to know the ad agency, at the very least, behind these. The ad from Columbus OH was awesome to see in real life. It was a lot bigger in person. Paint was EVERYWHERE in that parking lot! These are outstanding! Bravo! I wish I had that level of creativity. I need to spend couple minutes to staring at each advert… They r all fantastic!!! The Axe one is awful, I’m surprised that the owner of building allowed it. I don’t think objectifying actual women, supposedly students, like that is socially acceptable. I used to work in the “painted building”. The picture brought back many memories.